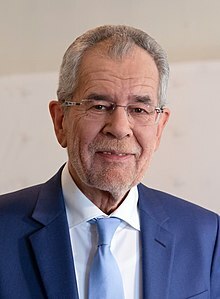 Alexander Van der Bellen (German pronunciation: [ˌalɛˈksandɐ fan dɛɐ̯ ˈbɛlən]; born 18 January 1944) is the current President of Austria. He previously served as a professor of economics at the University of Vienna, and after joining politics, as the spokesman of the Austrian Green Party. As a descendant of the Russian aristocratic von der Bellen (Van der Bellen) family of patrilineal Dutch ancestry, he was born in Austria to Russian and Estonian parents who were refugees of Stalinism, and became a naturalised citizen of Austria together with his parents in 1958. He was a member of the National Council representing the Green Party there from 1994 to 2012, and served as both leader of the party as well as its parliamentary group. He ran as a nominally independent candidate supported by the Greens in the 2016 presidential election, and finished second out of six in the first round before winning the second round against Norbert Hofer, a member of the Freedom Party. On 1 July, before he was due to be sworn into office, the results of the second round of voting were annulled by the Constitutional Court due to absentee votes being improperly counted too early, requiring the election to be re-held. On 4 December 2016, he won the ensuing election, taking approximately 54% of the vote. Van der Bellen has described himself as a centrist liberal and supports green and social liberal policies. As discussed in his 2015 book, he is supportive of the European Union and advocates European federalism. During the presidential election, he appealed to the political centre and was endorsed by the leaders of both the Social Democratic Party and the conservative People's Party. Van der Bellen is the second green president of a European Union country (after Raimonds Vējonis of Latvia) and the first to be directly elected by popular vote. In the 1700s Van der Bellen's patrilineal ancestors emigrated from the Netherlands into the Russian Empire. During the Russian Civil War (1917-1922) part of his family escaped from the Bolsheviks and migrated to the newly independent Republic of Estonia. Before this Van der Bellen's grandfather Aleksander von der Bellen served as the head of the civilian regional government of Pskov. Claiming Dutch origins the family changed its name from „von der Bellen“ to „Van der Bellen“. In 1931 Van der Bellen's father, who was also called Alexander, married his Estonian mother Alma (née Sieboldt) in Kihelkonna in Saaremaa, and later on the elder Van der Bellen also obtained citizenship of Estonia. In June 1940, as a result of the Molotov–Ribbentrop Pact Estonia was invaded by the Soviet Army and later annexed by the USSR. Subsequently, in February or March 1941 Van der Bellen's father, mother, and older sister Vivian-Diana moved to the national socialist German Reich; in line with the German–Soviet Frontier Treaty they were accepted as so-called Volksdeutsche. Van der Bellen's father was under the threat of repression by the Soviet secret service NKVD because of his origins and occupation as an international bank manager. Via Laugszargen (Memelland) and a German resettlement camp in Werneck at Würzburg, Van der Bellen's parents moved to Vienna, where their son Alexander was born in 1944 and baptised evangelically. As the Red Army approached Vienna, the family escaped to the Kaunertal in Tyrol, where his father later became active as a businessman again. In 1954, after completing primary school in Innsbruck, Van der Bellen started attending the Akademisches Gymnasium Innsbruck where he graduated in 1962 with his Matura. Until this time Van der Bellen had Estonian citizenship like his parents, obtaining Austrian citizenship around 1958. According to Van der Bellen himself, he did not complete the mandatory service in the Bundesheer. He underwent a Musterung (military fitness check) twice, the first one resulting in his being rated as unfit (untauglich). However, he successfully passed the second one. Later, he received several respites during his studies and after his marriage. After that Van der Bellen was no long summoned for service, due to his subsequent professorship. After receiving his Matura Van der Bellen started studying economics at the University of Innsbruck. He completed his studies in 1966 as Diplom-Volkswirt. With his dissertation Kollektive Haushalte und gemeinwirtschaftliche Unternehmungen: Probleme ihrer Koordination ("Collective households and public-service enterprises: Problems of their coordination") he was awarded the title of Dr. rer. oec (doctor rerum oeconomicarum) in December 1966. From 1968 to 1971 he served as a scientific assistant of Clemens August Andreae at the public finance institution of the University of Innsbruck, and from 1972 to 1974 as research fellow at the international institution for management and administration of the WZB Berlin Social Science Center. He established a friendship with Turkish economist Murat R. Sertel, with who he worked on decision and preference theories and later on published several articles and discussion papers. In 1976 Van der Bellen was appointed extraordinary university professor at the Innsbruck University, where he remained until 1980. During this time he moved to Vienna to study and research from 1977 to 1980 at the Verwaltungsakademie des Bundes. From 1980 to 1999 he was extraordinary university professor for economics at the University of Vienna. Between 1990 and 1994 he there also became dean of the faculty for economics at University of Vienna. In October 1999 he became parliamentary leader of the Greens in the National Council and thus resigned as university professor in January 2009. Van der Bellen retired in February 2009. Van der Bellen's research focused on planning and financing procedures in the public sector, infrastructure financing, fiscal policy, public expenditure, government regulation policy, public undertakings, and environmental and transport policy. He has published in professional journals such as the Die Betriebswirtschaft, Econometrica, Journal of Economic Theory, Österreichische Zeitschrift für Politikwissenschaft, Public Choice, Wirtschaftspolitische Blätter and the Zeitschrift für öffentliche und gemeinwirtschaftliche Unternehmen. Van der Bellen married when he was 18 years old and became a father for the first time at 19. His relationship with Brigitte (born Hüttner, 1943–2018) lasted over 50 years, until they divorced in 2015. He had two sons with her. Since December 2015 Van der Bellen has been married to a longtime friend and managing director of the Greens Club, Doris Schmidauer. He lives in Vienna and in Kaunertal, Tyrol. As a young man Van der Bellen left the Evangelical Church, because he was upset about his local pastor. According to his own words he does not believe in the one God, but in a "message or vision" ("Botschaft oder Vision"), which in his view the New Testament states. According to his own statement, Van der Bellen joined the only existing Freemason chapter in Innsbruck at the time, although he participated at meetings for a year, which he described as "being active". "After that, as a purely passive member, I paid the membership fee for about 10 years and finally left on my explicit request" ("Danach habe ich als rein passives Mitglied noch etwa 10 Jahre lang den Mitgliedsbeitrag bezahlt und bin schließlich auf meinen expliziten Wunsch hin ausgeschieden"), Van der Bellen in a ZIB 2 elections interview with Armin Wolf (18 May 2016). According to Van der Bellen, he is no longer a Freemason. After the second round of voting in the 2016 presidential elections, which Van der Bellen won, President of Estonia Toomas Hendrik Ilves congratulated him. The Estonian Ministry of Foreign Affairs stated that Van der Bellen could get back his Estonian passport at any time. This is only possible because Van der Bellen's parents were Estonian citizens before 16 June 1940; children of such parents are automatically accepted as citizens. Urmas Paet, former Foreign Minister of Estonia and a Member of the European Parliament said: "the election results are a reason to congratulate Austrians twice. For Estonia and its people, the fact that Austria has elected an Estonian citizen as its president also plays a role." Van der Bellen is sometimes also called "Sascha" (which is an abbreviation of his first name) by his friends, colleagues, and within his party. Van der Bellen was a member of the Social Democratic Party from the mid-1970s until the late 1980s, but his interests later turned towards the environmental movement. His former postgraduate Peter Pilz, back then the spokesman of the Green Party, brought Van der Bellen into his party. Van der Bellen later described these changes as a development "from an arrogant anti-capitalist to a generous left-liberal", although the latter self-image in his autobiography of 2015 also changed into a "liberal Anglo-Saxon coinage". In 1992, Van der Bellen was nominated by the Greens for the office of the President of the Court of Audit; he was defeated by the ÖVP-close Franz Fiedler. After the Greens suffered significant losses in the 1995 legislative elections on 17 December, Van der Bellen took over the party chairmanship from Christoph Chorherr in December 1997 and remained until October 2008, being the longest-serving spokesman in the history of the Austrian Greens, with almost eleven years in office. He assumed chairmanship with the party having 4.8% approval in polls at that that time. He led the party through three elections, each higher than the last: in the 1999 legislative elections the party got 7.4% of the vote, in the 2002 legislative elections it got 9.5% of the vote, and in the 2006 legislative elections the party got 11.05% of the vote. After losses in the 2008 legislative elections, in which the Green Party's voteshare dropped to 10.11%, Van der Bellen, dubbed "the green professor" by the media, resigned on October 3rd, 2008 as spokesman of the Green Party. He handed over the office to the Third President of the National Council at the time, Eva Glawischnig. As designated spokesperson she was elected administrative party leader on 24 October and later officially endorsed and sworn in by the party congress (Bundeskongress). With the beginning of the XIX. legislative period on 7 November 1994 Van der Bellen functioned as a member of the National Council for the first time and held this position until 2012. During the XXIV. legislative period he dropped out of the National Council on 5 July 2012. From 1999 to 2008 he was parliamentary leader of the Green Party in the National Council. During his time in the National Council, Van der Bellen also served as a member of the Budget, Main, Science, Financial, Industrial (as deputy chairman), Administrative and Foreign Affairs (as clerk and deputy chairman) committees as well as member of several subcommittees. In 2009/10 he was a substitute member and from 2010 to 2012 a member of the Austrian delegation to the Parliamentary Assembly of the Council of Europe in Strasbourg. After the 2008 legislative elections, he was proposed by the Greens, who were no longer the third strongest party, as a counter-candidate to the controversial FPÖ candidate Martin Graf for the post of Third President of the National Council, however, he failed to win the vote on 28 October 2008: Graf was elected with 109 out of 156 valid votes, Van der Bellen only received 27, and the remaining 20 votes went to other MPs. On February 2011, Van der Bellen was elected by the red-green city and state government as Commissioner for Universities and Research (also: Commissioner of the City of Vienna for Universities and Research, denotation in 2013). While he himself volunteered this activity, in addition to his still exercised National Council mandate, the new infrastructure office for him with a budget of 210,000 euros annually was endowed. As a university commissioner, he campaigned for the improvement of the relationship between the city of Vienna and the high schools located there, hence, universities, colleges and private universities. At his initiative, regular meetings took place for the first time between representatives of the Viennese universities and the Municipal Department 35 (Municipal Department of the City of Vienna) in order to improve cooperation in immigration and residence matters for third-country students and researchers. The initiative was taken up by the Austrian Universities Conference - The Austrian Conference of Rectors (uniko) and extended from Vienna to the whole of Austria. On the initiative of University Commissioner Van der Bellen, the Vienna University Circle, an informal advisory board composed of rectors and vice-rectors of Viennese universities, including the research institution "Institute of Science and Technology Austria" (IST Austria), were launched. At the 2010 Viennese state elections on 10th October Van der Bellen stood as a candidate on the 29th place of the list of the Vienna Greens. With the elections slogan "Go Professor go!" he reached 11,952 preferred votes and thus achieved a precedence on the first place. Although he stated in multiple interviews: "Should I get the preferential votes and it comes to a red-green government, I will definitely move into the Landtag", he still did not accept the Gemeinderat mandate after the elections and remained in the National Council til 5 July 2012. On 14 June 2012, Van der Bellen announced in a press conference to swap from the National Council to the Vienna Gemeinderat and Landtag. On 5 July 2012 he left the National Council. The inauguration took place in September 2012 at the first Gemeinderat meeting after the summer break. In January 2015, it was announced that Van der Bellen would retreat from Vienna's municipal politics at the end of the legislative period. In the internal list election of the Vienna Greens on 14 February, after the application deadline, he did not compete in the internal party candidacy. Thus he was no longer on a selectable place on the electoral lists of the Greens in the 2015 Viennese state elections. In 2001, Van der Bellen said that he turned from an "arrogant anti-capitalist" into a "broad-minded left-liberal" over the course of his political career. In his 2015 autobiography, Van der Bellen described himself as a liberal positioned in the political centre while downplaying his earlier description as left-liberal, and said he was inspired by the Anglo-Saxon liberal tradition, particularly John Stuart Mill. He is strongly supportive of the European Union, and advocates European federalism. During the 2016 presidential election, he appealed to the political centre and used "Unser Präsident der Mitte" (Our President of the Centre) for his campaign slogan. Van der Bellen has argued that Europe should accept refugees who have fled to Europe from war zones in Syria and elsewhere, and has often mentioned his own background as the son of refugees in debates. He has opposed the government's decision to impose a limit on how many asylum-seekers it will allow into Austria. Van der Bellen has commented that due to emerging Islamophobia and prejudice against women wearing headscarves, he could foresee a day when all non-Muslim women might also be asked to wear headscarves as a sign of solidarity with women who wear them on religious grounds. The remarks were criticized widely, especially on the political right. Van der Bellen has criticized U.S. President Donald Trump. He has opined that the British withdrawal from the European Union is damaging to the economies of both the United Kingdom and Europe. He is opposed to recognising the Russian annexation of Crimea. He has stated that the Austrian embassy in Israel should remain in Tel Aviv. Van der Bellen has criticized Turkish President Recep Tayyip Erdoğan and his supporters after mass pro-Erdoğan protests by Turks in Austria, saying: "In Austria there is freedom to demonstrate as long as it is peaceful. [...] Everyone that accepts the right to demonstrate, has to see that the same rights – such as freedom of speech, press freedom, independent justice system, and freedom to demonstrate are being denied in Turkey by President Erdogan." Since August 2014 Van der Bellen has already been regarded as a presidential candidate. The Green Party reserved the domain "vdb2016.at" through the media agency Media Brothers for a possible presidential candidacy of Van der Bellen in November 2014. After its reservation the party delegated the domain to the Association "Together for Van der Bellen" as of 6 January 2016. On 8 January 2016, Van der Bellen officially announced his candidacy for the 2016 presidential election by video message. Van der Bellen ran as an independent candidate and thus non-party nominee for the office of President. As the longest-serving leader of the Green party (from 1997 to 2008) and as an afterwards still active party member, Van der Bellen's claimed nonpartisanism was questioned and challenged throughout his presidential campaign. However, Van der Bellen officially suspended his party membership at the Greens as of 23 May 2016, demonstrating his willingness to strive for a nonpartisan incumbency. Regardless of that the Green Party still supported him during his campaign; establishing the Association "Together for Van der Bellen – Independent Initiative for the 2016 Presidential Election" which comprised six employees and premises as well as 1.2 million euros financial aid. The association is headquartered within the Green Party's head office, executive director of the association is Van der Bellen's campaign manager Lothar Lockl. For the repetition of the second ballot, the association received a total of 18,398 private donations, which amounted to about 2.7 million euros. In comparison Van der Bellen's run-off opponent Norbert Hofer was vested with 3.4 million euros by his party. The Greens however, suspected that this sum only encompassed monetary and no material donations. By running as a non-partisan candidate Van der Bellen could also avoid an official requirement for approval of the Green Party Congress. Thus discussions about the party basis as well as a possible non-unanimous voting result were bypassed. As an independent candidate it would legally not have been necessary for him to disclose the campaign donations. Nevertheless the Association "Together for Van der Bellen" still published them on their website. In the first round of the 2016 presidential election, Van der Bellen ranked second with 21.34% of the votes being behind Norbert Hofer with 35.05%. In the second round of voting (the runoff election) on 22 May 2016, the provisional final result excluding postal votes was: Norbert Hofer with 51.93% and Alexander Van der Bellen with 48.07%. Therefore no winner could be determined on election night. On the following day (23 May 2016), Interior Minister Wolfgang Sobotka announced the final results including postal votes, according to which Van der Bellen received 50.35% and Hofer 49.64% of valid votes. Van der Bellen had a lead of 31,026 votes on Hofer. The voter turnout was 72.7%. Following the election, the designated President Van der Bellen reaffirmed his views on the Freedom Party and stated that he would not charge them with the task to form a government, even if they became the largest party. This would have been a novelty in the history of the Second Republic, since so far all Presidents had charged the chairperson of the largest party with the government formation. On 8 June, Freedom Party chairman Heinz-Christian Strache brought in a 150-page notice of appeal to the Constitutional Court, which was intended to highlight deficiencies in the conduct of the second voting round. On 1 July 2016, the Constitutional Court consented the electoral appeal of the Freedom Party. Because of irregularities that occurred in the counting of postal voted, the election had to be repeated in the whole of Austria. Van der Bellen also won the second runoff election postponed to 4 December 2016, receiving 53.8% of valid votes (with a voter turnout of 74.2%). While Van der Bellen's lead in the run-off vote on May 2016 amounted to barely less than 31,000 votes, he was able to expand his lead in the second run-off vote on December 2016 to over 348,000 valid votes. Alexander Van der Bellen has official been inaugurated President of Austria on 26 January 2017. After his inaugural speech he met with the Kern government and was greeted with a military ceremony as the new commander-in-chief of the Bundesheer. Grand Decoration of Honour in Gold with Star of the Decoration of Honour for Services to the Republic of Austria (4 May 2004). Grand Star of the Decoration of Honour for Services to the Republic of Austria (26 January 2017). Grand Star of the Order of Merit of the Principality of Liechtenstein (20 March 2018). ^ "Die 10 wichtigsten Antworten zu Alexander Van der Bellen". www.heute.at (in German). Retrieved 2018-06-11. ^ "Austria far-right candidate Norbert Hofer defeated in presidential poll". BBC Online. 4 December 2016. Retrieved 4 December 2016. ^ Renon, Danielle (4 December 2016). "Autriche. Van der Bellen président: un soulagement face au populisme" [Austria. Van der Bellen President: A relief from populism]. Courrier International (in French). Retrieved 5 December 2016. ^ "Bundessprecher und Klubobmann, Abgeordneter zum Nationalrat – Univ. Prof. Dr. Alexander Van der Bellen" (in German). Die Grünen. 14 September 2008. Archived from the original on 14 September 2008. ^ "Van der Bellen sichtlich bewegt" (in German). ORF. September 2008. Retrieved 5 December 2016. ^ Smale, Alison (23 May 2016). "Austrian Far-Right Candidate Norbert Hofer Narrowly Loses Presidential Vote". The New York Times. Retrieved 24 May 2016. ^ Osborne, Samuel (23 May 2016). "Austria presidential election result: Alexander Van der Bellelosess over far-right candidate Norbert Hofer". The Independent. Retrieved 4 December 2016. ^ "Österreich - Bundespräsidentenwahl 2016". ^ a b c Pink, Oliver (14 May 2016). "Wie links ist Van der Bellen?" [How left is Van der Bellen?]. Die Presse (in German). Retrieved 5 December 2016. ^ a b c Van der Bellen, Alexander (2015). Die Kunst der Freiheit: In Zeiten zunehmender Unfreiheit (in German). Brandstätter Verlag. ISBN 9783850339223. ^ a b ""Wenn es die EU nicht gäbe, müsste man sie erfinden"" (in German). Die Grünen. 28 September 2015. Retrieved 5 December 2016. ^ Connolly, Kate; Oltermann, Philip; Henley, Jon (23 May 2016). "Austria elects Green candidate as president in narrow defeat for far right". The Guardian. Retrieved 16 June 2016. ^ "Van der Bellen als "Unser Präsident der Mitte" im Finale" [Van der Bellen as "Our President of the Centre" in the final]. Wiener Zeitung (in German). 18 November 2016. Retrieved 5 December 2016. ^ "Divided Austria votes in rerun of presidential contest". Al-Jazeera. 4 December 2016. ^ correspondent, Jon Henley European affairs (23 May 2016). "Who are the two men who competed to be Austria's next president?" – via The Guardian. ^ "Austrian election: why is it significant and what does it mean for EU policy on borders, migrants and refugees?". The Daily Telegraph. 24 April 2016. ^ "Van der Bellens Tag an dem alle Frauen Kopftuch tragen". ^ "Austria's president suggested that every woman should wear a headscarf to fight Islamophobia". Washington Post. Retrieved 2017-04-28. ^ EpochTimes.de (12 November 2016). "Van der Bellen poltert gegen US-Präsident Trump und warnt vor FPÖ-Mann Hofer". ^ a b c "Bundespräsidentenwahl: Wie Hofer und Van der Bellen ihre Außenpolitik anlegen würden". ^ "Erdoğan supporters told to keep politics out of Austria". The Local. 19 July 2016. ^ "EU darf vor Erdogan nicht in die Knie gehen". Kronen Zeitung. 3 August 2016. ^ "Präsidentschaftswahl: Grüne reservierten "www.vdb2016.at"". www.derstandard.at (in German). Retrieved 2018-12-05. ^ "vdb2016.at". whois.domaintools.com (in German). Retrieved 2018-12-05. ^ "Mutig in die neuen Zeiten! Van der Bellen kandidiert als Bundespräsident". www.youtube.com (in German). Retrieved 2018-12-05. ^ "Macht und Ohnmacht des Präsidenten". www.nzz.ch (in German). Retrieved 2018-12-05. ^ "Van der Bellen ist Bundespräsident - news.ORF.at". news.ORF.at (in German). Retrieved 2018-12-05. ^ "Grüne: Van der Bellen bekommt 1,2 Mio. Euro und Sachspenden". www.diepresse.com (in German). Retrieved 2018-12-05. ^ "Medieninhaber & Herausgeber: ‚Gemeinsam für Van der Bellen – Unabhängige Initiative für die Bundespräsidentschaftswahl 2016', Rooseveltplatz 4-5, 1090 Wien". „Mag. Lothar Lockl, Vorsitzender des Vorstands". www.archive.is (in German). Retrieved 2018-12-05. ^ "Offenlegung der Zuwendungen". www.archive.is (in German). Retrieved 2018-12-05. ^ "Van der Bellen: „Lösen die Probleme nicht mit Extremen"". www.diepresse.com (in German). Retrieved 2018-12-05. ^ "Wahlkarten ausgezählt: Alexander Van der Bellen ist Bundespräsident - derstandard.at/2000037495444/Der-Sieger-der-Bundespraesidentenwahl-heisst". www.derstandard.at (in German). Retrieved 2018-12-05. ^ "Van der Bellen in CNN: Sieg „trotz Migrationshintergrunds"". news.orf.at (in German). Retrieved 2018-12-05. ^ "FPÖ-Wahlanfechtung eingebracht - HC Strache: Hofer hätte Präsident werden können". web.archive.org (in German). Retrieved 2018-12-05. ^ "Wahlanfechtung: Höchstgericht hebt Stichwahl vollständig auf". www.derstandard.at (in German). Retrieved 2018-12-05. ^ "Endergebnis mit Briefwahl: Van der Bellen kommt auf 53,79 Prozent". www.derstandard.at (in German). Retrieved 2018-12-05. ^ "Stimmenstärkste Kandidaten pro BundeslandHoferVan der Bellen". www.bmi.gv.at (in German). Retrieved 2018-12-05. ^ "Alexander Van der Bellen als Bundespräsident angelobt". www.derstandard.at (in German). Retrieved 2018-12-05. ^ "Ein Flüchtling, der in Österreich Präsident wurde". www.sueddeutsche.de (in German). Retrieved 2018-12-05. ^ "Ehrenzeichen für verdiente Mandatarinnen – Silhavy, Spindelegger, Steibl, Trunk und Van der Bellen geehrt" [Honours Earned – Silhavy, Spindelegger, Steibl, Trunk and Van der Bellen] (in German). Österreichisches Parlament. 4 May 2004. Retrieved 18 December 2008. ^ "Bundeskanzler Anfragebeantwortung an die Präsidentin des Nationalrats Barbara PRAMMER schriftliche parlamentarische Anfrage betreffend Orden und Ehrenzeichen" [Federal Chancellor's Reply to National Council President Barbara PRAMMER Regarding a Written Parliamentary Question Concerning Orders and Honours] (PDF) (in German). Österreichisches Parlament. 23 April 2012. p. 1644. Retrieved 5 December 2016.